Above: Leonard Penn in the serial King of the Congo (Columbia, 1952). 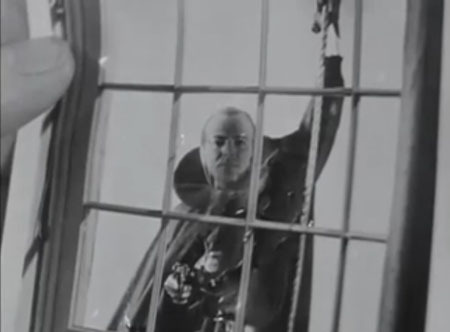 Leonard Penn entered the serial scene later than the genre’s other great villains, and found fewer first-rate vehicles than any of them did; all of his chapterplays were post-war outings, produced by Sam Katzman for Columbia Pictures, and almost all of them were very uneven in quality. However, Penn’s performances in these serials were far from uneven; he turned in consistently excellent work throughout his chapterplay career–using an urbane but arrogantly self-assured manner, and a smooth speaking voice with a harshly sinister undercurrent, to make his heavies seem at once suave, intelligent, tough, and threatening. Leonard Penn was born in Springfield, Massachusetts, not long after his Russian Jewish parents immigrated to the United States. According to federal census records, his father, Marcus Penn, was a real-estate salesman–evidently a successful one, since he was able to send his son to New York’s Columbia University; the younger Penn majored in drama at Columbia, and pursued a professional acting career following his graduation. He appeared in several Broadway plays during 1934 and 1935, and in the latter year married well-known stage actress Gladys George, subsequently accompanying her out to Hollywood in 1936. According to a 1937 movie-news blurb (in the April 19th edition of Florida’s Evening Independent), Penn was “doing well as a business man” at the time of his move to the West Coast and had temporarily abandoned the stage, but decided to try his hand at acting again after finding himself in Hollywood. He screen-tested with Metro-Goldwyn-Mayer in 1937, and won a noticeable role in their Jeanette MacDonald vehicle The Firefly; MGM subsequently gave him a contract and awarded him prominent parts in several other features (Between Two Women, Girl of the Golden West, Man-Proof) during the late 1930s. Columnist Louella Parsons predicted possible MGM stardom for Penn after his short but memorable turn as a heroic soldier in that studio’s Marie Antoinette–but by 1939 he had left MGM, and was appearing in supporting roles at other studios (chiefly RKO); that same year, a near-fatal bout of peritonitis put him out of the movie business for several months. He returned to the Broadway stage in 1940, and remained there until late 1941, when he joined the US Navy. Penn stayed in the Navy for the next five years and served in World War 2; he was discharged as an officer in 1946. He went back to Hollywood after his discharge, but was unable to re-establish himself at the major studios; Gladys George had divorced him in 1944, and other members of the higher-ranking movie set had forgotten him. He ultimately made his first post-war screen appearance in the 1946 serial Chick Carter, Detective, released by Columbia Pictures and produced by Sam Katzman. This remarkably dull fifteen-chapter crime saga derived much of the little energy it possessed from Penn’s excellent turn as a gunman named Vasky, the henchman of gangster Nick Pollo (George Meeker). Both the Pollo character and his chief rival, nightclub owner Joe Carney (Charles King), were depicted as careful crooks unwilling to go too far outside the law, which left Penn’s less cautious Vasky to carry the serial’s villainy almost single-handled, blithely disregarding the warnings of Pollo as he repeatedly tried–sometimes with success–to kill off various good guys and rival bad guys during his relentless search for a stolen diamond. Penn played this murderous character with a truly menacing combination of impatient ferocity and cool self-confidence; his characterization didn’t save Carter, but did make the serial a little more watchable. 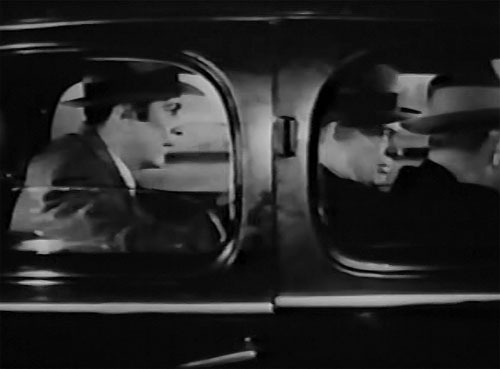 Above: Dangerous backseat driver Leonard Penn has the drop on Robert Elliott and Jack Ingram (only partially visible) in Chick Carter, Detective (Columbia, 1946). 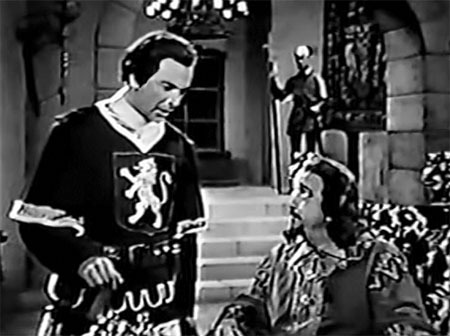 After appearing in one of Katzman’s high-school comedies over at Monogram, Penn made his second chapterplay for the producer, the medieval adventure serial Son of the Guardsman (1946). Sunk by a low budget, a repetitive storyline, and uninspired action scenes, this extremely disappointing swashbuckler–like Chick Carter–at least gave Penn a good part; as in Carter, he made the most of his role, and helped to keep the serial from falling completely flat. He was cast as Mark Crowell, the secretary, lieutenant, and chief councilor of robber baron Sir Edgar Bullard (Charles King); though an ostensible subordinate, his shrewdly ruthless character provided Bullard with most of his schemes, and came off as the real brains of the villains’ team–continuing to advise the evil Duke of Hampton (John Merton) after the latter superseded Bullard as the chief heavy in the later episodes. Penn was ideally cold, slick, and haughty in this Machiavellian role, while his polished, stage-trained voice made him sound much more at home in the serial’s medieval milieu than most of his co-stars, many of whom were burdened by strong regional American accents. Above: Leonard Penn and Charles King hatch a scheme in Son of the Guardsman (Columbia, 1946). 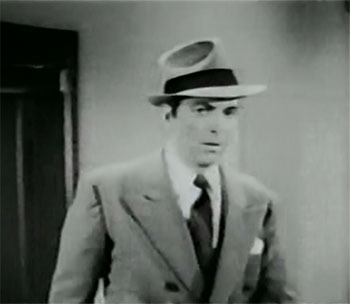 During the remaining years of the 1940s, Penn balanced West Coast stage and radio work with film appearances–making almost all of the latter in B-mysteries for studios like PRC and Pine-Thomas, B-westerns for Monogram and William Boyd’s Hopalong Cassidy Productions, and chapterplays for Katzman. His next serial outing was the meandering and erratic Brick Bradford (Columbia, 1948), which gave him a much smaller role than his two previous cliffhanger outings had; as Eric Byrus, one of the assistants to brilliant scientist Dr. Tymak (John Merton), he was initially a sympathetic character, but had little to do for two-thirds of the serial’s running time but get kidnapped by the villains who were seeking to steal Tymak’s “interceptor ray,” or stand in the background while Tymak’s senior assistant (Wheeler Oakman) explained the workings of various gadgets. However, he finally became prominent in Chapters Eleven through Fourteen, in which he reverted to villainy; his character suddenly decided to steal the interceptor ray himself and sell it to the heavies at his own price. This treachery ultimately got Byrus killed off, but also gave Penn some good opportunities to lie smoothly (when trying to convince both good guys and bad guys of his trustworthiness) and snarl arrogantly (when talking about the wealth and power that his possession of the ray would bring him). 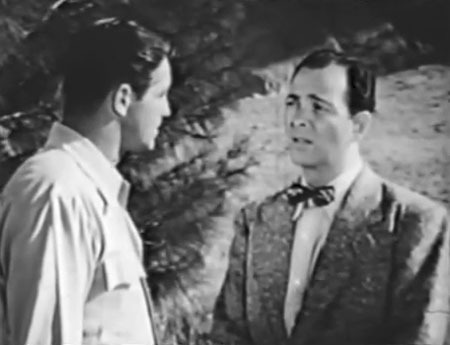 Above: Leonard Penn gives Kane Richmond some false information in Brick Bradford (Columbia, 1948). Superman (Columbia, 1948) was the best of the Columbia serials in which Penn appeared, but it gave him a very minor role; he appeared in one chapter as a crooked electronics-store clerk who first politely tried to misdirect snooping reporter Jimmy Olsen (Tommy Bond), then less politely assisted chief henchman George Meeker in an attempt to exterminate the newshound. He followed this small part with a much bigger one in Congo Bill (Columbia, 1948); this mediocre jungle serial gave him his first full-fledged brains heavy role as Andre Bocar, the leader of a gang of gold-smugglers who repeatedly clashed with Congo Bill (Don McGuire) and with the white queen (Cleo Moore) of the tribe that guarded the gold. Penn’s Bocar was forced to split his screen time with a second villain, scheming circus proprietor Bernie McGraw (I. Stanford Jolley), and was eliminated from the serial shortly before the last-chapter showdown, but still served as the chief antagonist for most of Congo Bill’s running time. Penn easily dominated the scenes in which Bocar appeared, giving the jungle criminal a superficially sleek and civilized manner that gave way to bluntly vicious hostility whenever someone tried to cross him. 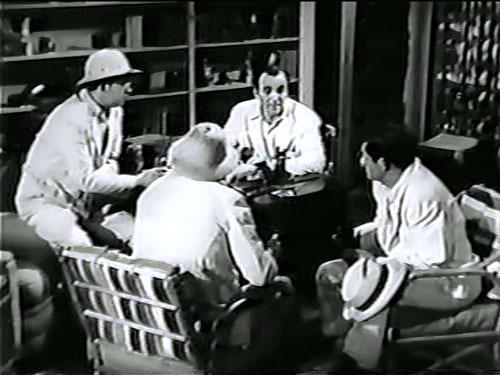 Above: Leonard Penn presides over a plotting session in Congo Bill (Columbia, 1948); his cohorts, left to right, are Anthony Warde, Rusty Westcoatt, and Fred Graham. Above: Leonard Penn makes a deal with witch doctor Frank Lackteen in Congo Bill (Columbia, 1948). Batman and Robin (Columbia, 1949), a lackluster chapterplay that starred Robert Lowery and John Duncan in the title roles, again cast Penn as the chief villain–though he was not officially revealed as such until the last episode. He provided the voice of the masked scientific criminal, the Wizard, and also made a series of brief appearance as Carter, the attendant of wheelchair-bound inventor Professor Hammil (William Fawcett); Carter was killed off in Chapter Fourteen, but then revealed to be the Wizard in the final chapter (after off-handedly explaining that his heretofore unmentioned twin brother had actually died in the fourteenth episode). Penn gave Carter a noticeably milder and quieter voice than he usually used, and also affected a politely self-effacing manner when waiting on Hammil; his Wizard, on the other hand, was authoritative to an overbearing degree. Penn’s vocal performance in the latter role helped to make the Wizard the most memorable part of the serial; the master villain came off as both sinister and darkly amusing, thanks to the bitingly sarcastic and smugly confident tones in which Penn rebuked his henchmen, threatened Batman and Robin, or proclaimed his own genius. Above: Leonard Penn abjectly apologizes to a fuming William Fawcett in Batman and Robin (Columbia, 1949). Above: Lyle Talbot’s Commissioner Gordon (that’s his thumb) holds up an incriminating photo of Leonard Penn in Wizard regalia (sans mask) in Batman and Robin. Penn’s last 1940s serial was the offbeat chapterplay Adventures of Sir Galahad (Columbia, 1949), an entertaining outing which–despite some plot holes–was easily the best of Penn’s serials save Superman. He was cast as Sir Modred, one of King Arthur’s (Nelson Leigh) Knights of the Round Table, and provided his king with seeming support in his war against the Saxons, while continually trying to hamper the quest of would-be knight Galahad (George Reeves)–who was determined to find the King’s magic sword Excalibur, stolen while Galahad guarded it. The man behind this theft was the mysterious Black Knight, a traitor plotting with the Saxons to overthrow Arthur; as anyone familiar with the Arthurian mythos could have predicted, Modred was unmasked as the Black Knight in the final chapter, and subsequently slain (with the recovered Excalibur) by Arthur. 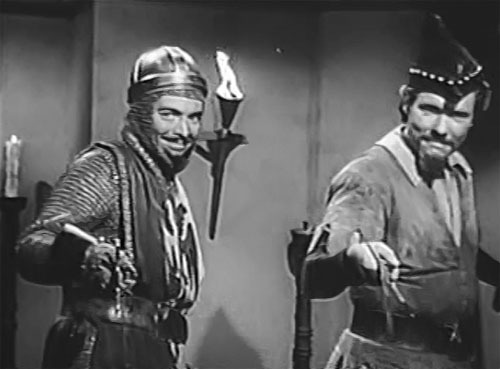 Oddly, though Modred’s guilt was a foregone conclusion (he was even exposed as a villain well before his final unmasking), Katzman and his production crew took greater pains to hide the Black Knight’s real identity than they had that of the Wizard in Batman and Robin, and used Paul Frees to dub all of the Knight’s dialogue. Though deprived of the chance to voice another mystery villain, Penn still made an impression as Modred–deferring with feigned respect to Arthur, but sneering imperiously at Galahad whenever the hero tried to get help from the Round Table. Above: Leonard Penn questions George Reeves’ (center) strategy in Adventures of Sir Galahad (Columbia, 1949). Charles King is on the right. 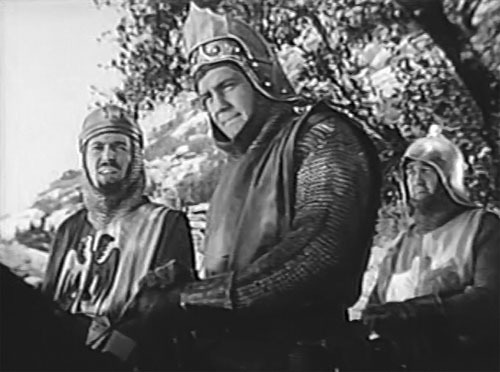 Above: Leonard Penn and henchman Don Harvey prepare to skewer an off-camera George Reeves in Adventures of Sir Galahad. Penn began to work regularly in television during the early 1950s, appearing with particular frequency on The Gene Autry Show, The Range Rider, and The Cisco Kid; he also appeared in many more B-westerns (principally for Monogram) and some non-Western features, most of which were Katzman productions for Columbia. He made three more serials for Katzman as well, the first of which was Mysterious Island (Columbia, 1951). Loosely based on a Jules Verne novel, Island was a plotless and interminably plodding serial that pitted a group of 19th-century castaways–stranded on the titular island–against natives, pirates, and invaders from outer space; the beleaguered group was periodically aided by a mysterious man in a diving suit, who eventually revealed himself as the famous scientist Captain Nemo and enlisted the castaways’ aid in an attempt to stop the space invaders. Nemo was played by Penn, who, partially disguised by whitened hair, did an excellent job in his first genuinely non-villainous serial role–making Nemo seem both benevolent and aloof; he also gave the Captain a subtle air of world-weary melancholy. However, he was kept almost completely off-stage until Chapter Fourteen–an unfortunate decision, since his strong characterization, if given more screen time, might have done something to offset the general tedium that dominated most of the serial. 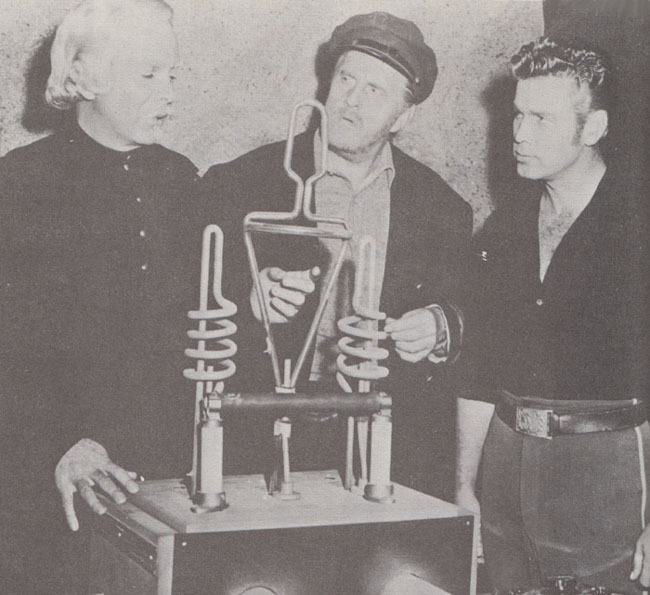 Above: Leonard Penn explains a scientific device to Gene Roth (center) and Richard Crane in Mysterious Island (Columbia, 1951). 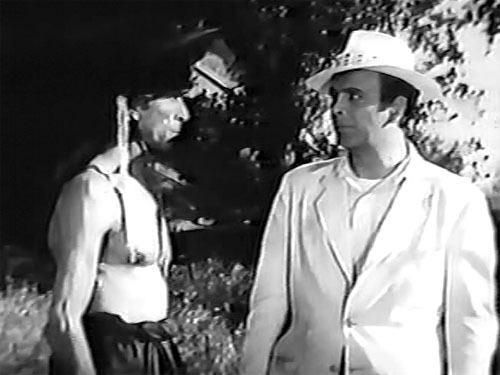 Penn returned to villainy in his next serial, King of the Congo (Columbia, 1952); this thoroughly pedestrian chapterplay starred Buster Crabbe as Captain Roger Drum, a US Air Force officer who became the jungle champion Thunda in order to battle a gang of Soviet agents in the African jungle. 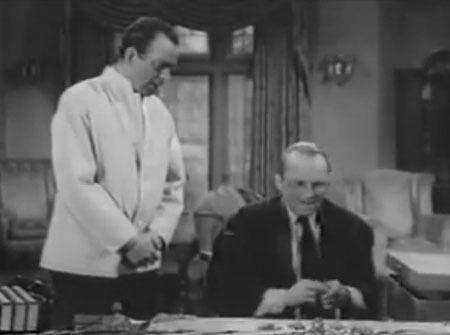 Boris, the leader of these Reds, was played by Penn, who managed to give the character a noticeable but restrained and convincing Russian accent (Penn was probably assisted here by memories of his parents’ accents). He also gave Boris an unshakably confident demeanor that seemed very appropriate to a committed Communist agent, questioned potential dissidents with ominous urbanity, and delivered orders with such brusque authority that he made it slightly easier to believe in the villains’ absurdly impractical master plan of using a handful of agents and primitive local allies to conquer Central Africa. 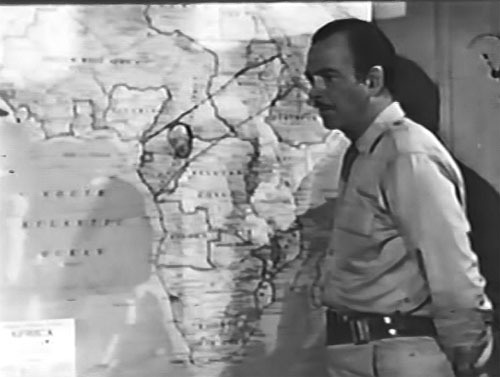 Above: Leonard Penn broods over his map of Africa in King of the Congo (Columbia, 1952); the pair of lines show the stretch of territory he’s supposed to conquer. 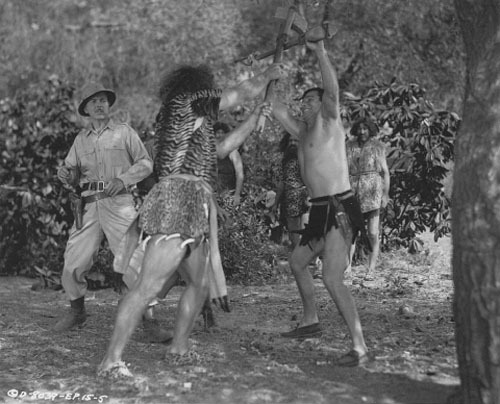 Above: Leonard Penn watches cautiously as his cave-man ally Rusty Westcoatt battles Buster Crabbe in King of the Congo. Penn’s final serial was The Lost Planet (Columbia, 1953), a talky science-fiction effort so crammed with long-winded outbursts of technobabble that it came off as more comic than anything else. Penn played a sly but ultimately sympathetic gambler/racketeer named Ken Wolper, who hoped to seize and exploit the valuable gadgetry of mad scientist Dr. Grood (Michael Fox), and who ordered his henchmen to temporarily cooperate with hero Rex Barrow (Judd Holdren) in order to do so; however, Wolper and his gang eventually forgot their selfish motives and wholeheartedly joined forces with Barrow, after learning that Grood threatened the safety of the entire world. Penn made a series of brief appearances throughout the serial, devoting most of his screen time to receiving reports from his associates; he finally became directly involved in the action in Chapter Fourteen, in which he rescued one of his henchmen and the hero from Grood’s assistant Jarva (Jack George), and thus paved the way for the final overthrow of Grood. Penn’s handling of this rescue sequence gave the serial one of its highlights; his gruffly sardonic manner as he defied the pompous Jarva, and the down-to-earth way in which he used a simple handgun to destroy Jarva’s gadgets, made the scene one calculated to evoke both laughs and cheers. 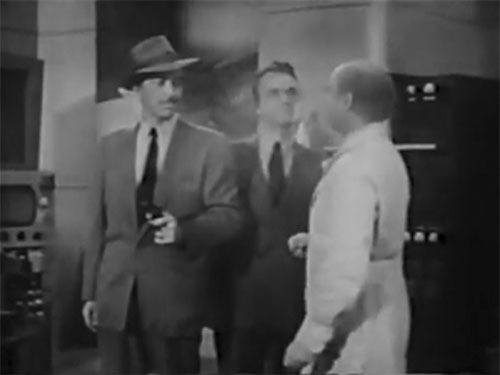 Above: Gunsmoke clears away as Jack George (far right) begs Leonard Penn to stop shooting up his laboratory in The Lost Planet (Columbia, 1953); Nick Stuart is in the center. 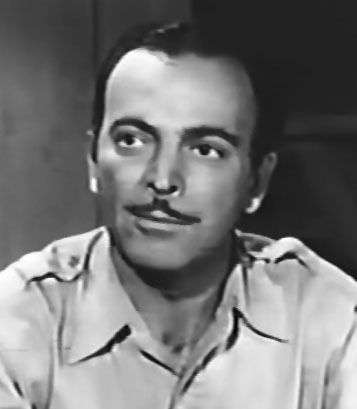 Penn worked principally in television, stage, and radio from 1953 onwards, though he would continue to appear in feature films on occasion; in 1954 he played a recurring role on Rocky Jones, Space Ranger, as one of Rocky’s rangers, and kept appearing frequently as a heavy on various Western TV shows throughout the rest of the decade. He retired from screen acting around 1960, but continued to do radio and stage work for some time afterwards; he succumbed to cancer in a Los Angeles hospital in 1975. Leonard Penn was to Columbia’s post-war serials what Roy Barcroft was to Republic’s post-war serials–a reliable and memorable villain whose mere presence in the cast list guaranteed the viewer some measure of entertainment. Unfortunately, unlike Barcroft, Penn was rarely supported by good production values or adequate scripts. With the exception of Superman (in which his role was miniscule) and Adventures of Sir Galahad, all of his serials ranged from mediocre to substandard, and as a result he’s rarely received attention from cliffhanging buffs. Nevertheless, his performances were so uniformly strong that he deserves a place in the top ranks of serial villainy, despite the fact that his chapterplays were almost never as good as he was. Above: Leonard Penn makes a wary entrance in Chick Carter, Detective (Columbia, 1946). Acknowledgements: The lead-off article in this online issue of Boyd Magers’ Serial Report–consisting of a condensed interview with Penn’s second wife, stage and television actress Louise Arthur, and an overview of his career–provided me with some of the information in this article, although I must note that the piece incorrectly gives “Leonard Pennario” as his real name; that is the name of a well-known pianist and composer, but not of the serial actor: federal census documents clearly indicate that both our Leonard and his father Marcus simply used the surname of “Penn”–(it was presumably changed from something more Russian immediately upon the family’s arrival in the US). The above-mentioned censuses were also of great help to me, as were several 1930s and 1940s newspaper articles reached via Google’s archives.